This day and age we have privileges mankind before us has never had. Supermarkets full of foods, and fast food chains everywhere. Never before have we had such opportunities to eat 24 hrs a day. The temptations we eat are killing us in bigger numbers. If the supermarkets took all the products off the shelves that have sugar in them two thirds of all shelves would be empty. Nobody can eat a lot of sugar on its own. Nor can they eat a lot of fat on its own. Put them together and most people will over indulge on them. Film stars and top athletes look super when they scrub up. Most people who eat too much of the wrong foods look the opposite. Lack of exercise and poor choice of food makes us look poorly while those that look after themselves follow the health and wellness trail. That is quality foods and supplements. Every persons microbiome is different so that we all absorb sugar, fats and carbohydrates in a different way. As we get older we should all be using supplements to encourage our bodies to not lose our energy. One of our biggest problems when aging is loss of gut flora affecting our digestive system.We then gain weight because of more bad bacteria than good in our gut. 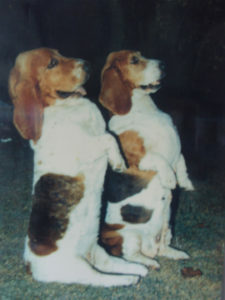 My two beggars for food …………..OUR two Champion Basset hounds, Molly and Mandy, Milly is asleep. MOLLY AND MANDY ARE REAL BEGGARS FOR THE WRONG FOODS. YOU SHOULD KNOW BETTER BEING ADULT HUMANS. shower when the doorbell rings. Before she says a word, Bob says, “I’ll give you £800 to drop that towel. her gown to reveal a leg. his hand up her leg.